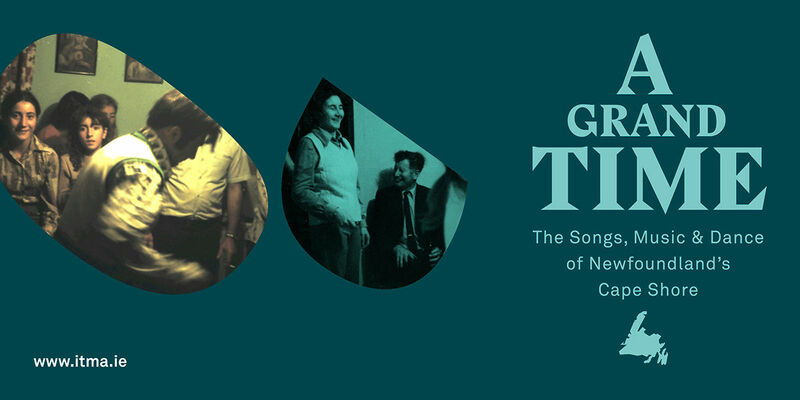 Join us for the launch and homecoming of ‘A Grand Time: The songs, music, and dance of Newfoundland’s Cape Shore,’ ITMA's newest digital exhibition. Paula & Mary Jean Roche watch Henry Power enjoy 'a few scuffs,' and Rita Roche & Henry Nash enjoy 'a time' in the Roche family kitchen, Branch, St Mary's Bay, Newfoundland, 1975 (photos courtesy Aidan O'Hara). Remember, explore, and share the evolving traditions of a Newfoundland-Irish community. Featuring +60 archival recordings, images, interviews, and more, this digital exhibition bridges trans-Atlantic and multigenerational traditions. More than 40 years ago, Irish-Canadian broadcaster Aidan O’Hara visited the Cape Shore equipped with a reel-to-reel tape recorder. He forged friendships and made recordings that have endured a lifetime. Using digital technologies and an innovative online platform,‘A Grand Time’ brings a sampler of these recordings home for the first time in a generation. The first of three launch events that are taking place in Newfoundland. It is a community celebration of the songs, music, and dance of the Cape Shore. Listen to historic recordings, swap songs, and visit with Aidan and Joyce O’Hara, as well as the ITMA team. Learn about the work of archives and the process of preparing this online exhibition. The ITMA team will be joined by singers from the Cape Shore (including Eta Nash, Vince Roche, and Eugene Mooney), as well as poet and playwright Agnes Walsh. Aidan O’Hara’s integral involvement in setting up NL Folk Festival during the 1970s makes this a fitting conclusion to a week of celebrations. Singer Anita Best will host a workshop featuring, among others, Carolann and Juanita Lyver, Vince Roche, and Eugene Mooney.